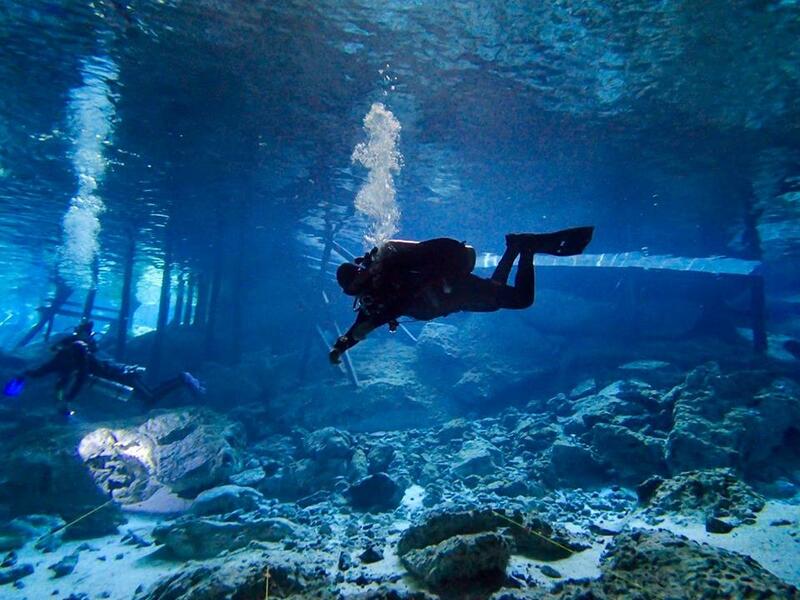 Experience this underground environment scuba diving in these sacred Mayan cenotes with ancient formations. They are the entrance to the underwold for the Mayans and we are lucky to be allowed to dive into them. You are lucky to be here and as a diver you can’t miss the opportunity to dive in these cenotes which are unique in the world. For the adventurer certified diver, this unique network of underground caverns located in the jungle, offers the amazing experience of scuba diving through crystal clear fresh water with spectacular light effects between stalactites and stalagmites, discovering ancient fossil remains. Discover a unique dive in the world that’s super safe and always guided by an expert cenote dive guide. PRICE INCLUDES: 2 dives in cenotes' caverns, round transportation from Playa del Carmen town, flashlight, dive guide, cold beverages, snacks (cookies/fruits), lunch (sandwich), cenote's entrance fee and taxes. SCHEDULE: Usual pick up time is at 8:00 hs in Playa del Carmen town and drop off around 14:00/16:00 hs depending on the cenote we are diving.